I routinely make a note to self to check old to-do lists when I remember that I’ve forgotten an important task. That I forget tasks often is a sad commentary on my attention span, but that’s not the point. The point is, I would be lost if I didn’t scatter notes to self all over the house like rose petals at a wedding. Yes, there are reminder apps on my phone and email, but they require thought and planning. Notes to self only require scraps of paper and something to make marks. Pencils, pens, crayons, soot from the fireplace, finger paints, blood from the paper cut you got tearing off the scrap of paper – any of these will do. When you’ve written your note, you can be sensible and place it where you are likely to find it. That place will not include your desk, because it is already filled with other things. It should not include the freezer, even if that is where you generally find your coffee mug (admit it, the mug ends up there when you think about your latest plot twist while looking for something for dinner at the same time). My preference is to create a personal, private treasure hunt of notes to self. The surprise of finding a reminder to pay an important bill immediately can often shock my little gray cells into remembering what my character’s arc was supposed to be before I wrote that last chapter that changed everything. Go ahead, regale me with stories of perfectly organized electronic calendars and to-do lists. Brag about never missing appointments and always being on top of events. Just leave me with my scraps of paper artfully decorating every flat surface. 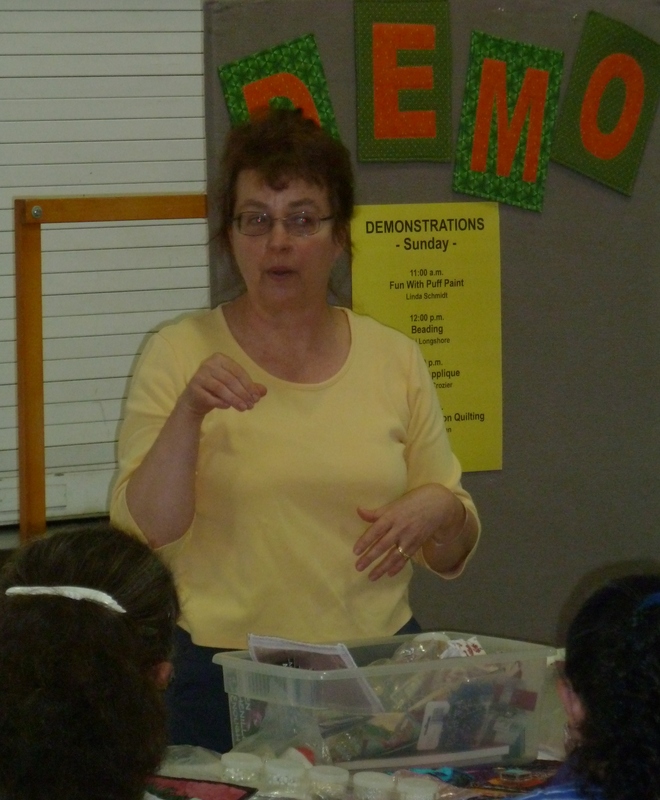 Amador Valley Quilters had their quilt show last weekend. It was a fabulous show, with Alex Anderson as the featured artist and a special exhibit of Quilts of Valor projects. We also had members giving demonstrations of various techniques, and I demonstrated beading. Beads can substitute for embroidery, and enhance bindings. 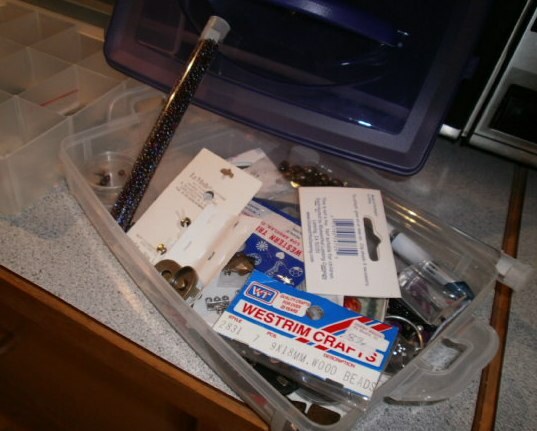 They can be used to hide piecing or quilting errors, or can be scattered over the surface just because you’ve got them. I like to turn otherwise unusable jewelry into embellishments, too, and I lump that under beading when I’m giving a demonstration. 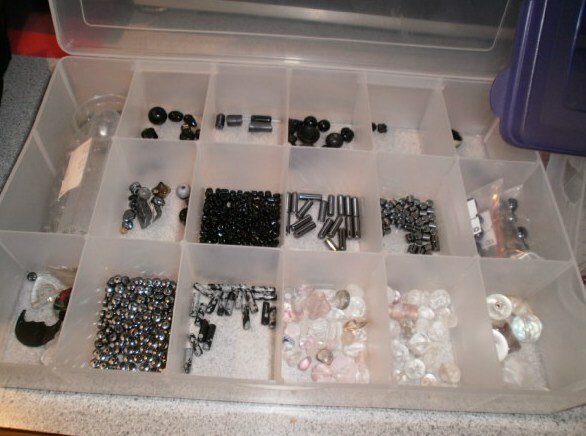 Being me, I have my beads squirreled away in many corners of the sewing room, some in containers with projects in various stages of completion. Pulling the stuff together for a demonstration requires me to paw through bins, boxes and stacks – which means I’ll get distracted and come up with another dozen or so projects before I remember what I’m doing. This year, I decided to turn that character flaw into a teaching moment. I brought a sample of the various sorting systems I have used over the years. This collection does not show how well they work, but illustrates how many choices there are and (I hope) serves as a warning to those who have a a tendency to buy these systems because they are so darned cute. I also hope it will encourage others to do what I have found impossible, namely develop an organizational system and stick with it. Of course, if I could have done that three years ago I wouldn’t have anything to write about in my blog, and that would be sad. Returning from vacation means trying to remember what it is I do around here, which buttons I should never push under any circumstances, who likes coconut and who doesn’t (I think it’s only me). It also means getting back to the to-do list. 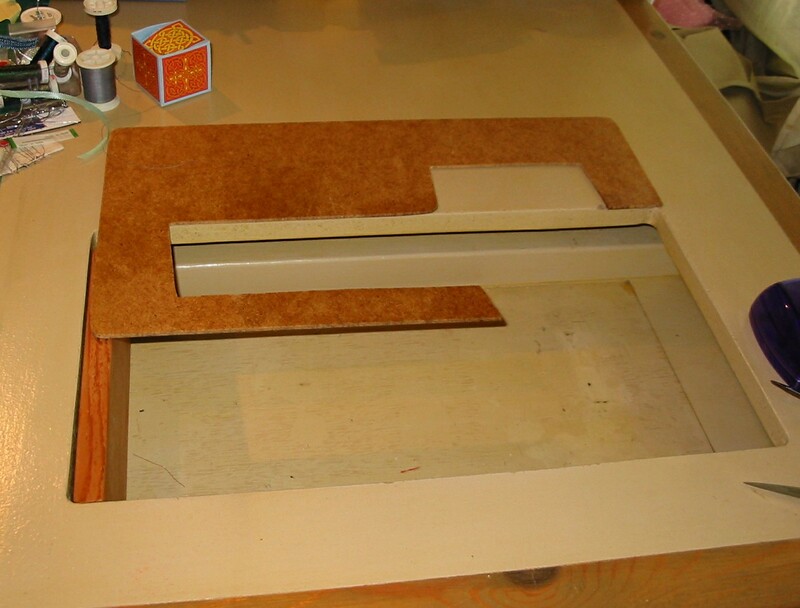 So, I headed off to dust my sewing table. After three years of saying, “One more project and then the sewing machine goes in for a tune-up,” I packed my trusty Viking off to the shop before we left for a family reunion. I’m afraid to hear what lurked inside once I saw the compacted layer of dust bunnies and threadies underneath it. Although I made time to pack up the machine, I did not make time to pack up the fabric I was using to make kits. Nor did I take time to clear off the ironing board. Cleaning off the ironing board is second on the list. 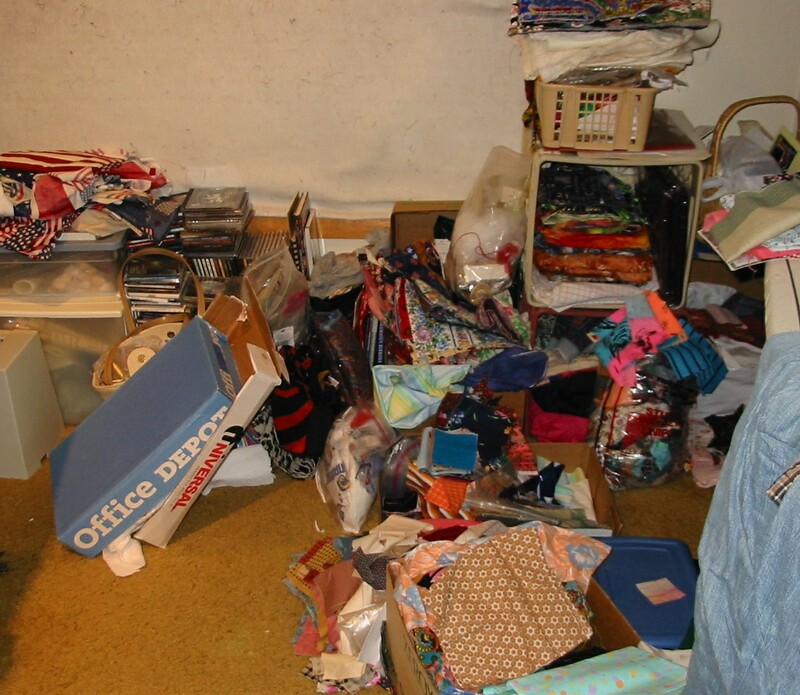 Once I’ve dusted the sewing table, I need to fix some clothing for my son. And that’s where the title of today’s blog comes in – he asked me to fix a zipper. Now that you’ve stopped shrieking, let me remind you that if you don’t know something is hard, you just do it. The first time I joined a friendship group, I asked them to make Bear Paws blocks for me. Kind ladies that they are, they didn’t grumble a bit. I don’t know if I can ever apologize enough to them. At any rate, I told my son I would try to fix the zipper, but it might take some time and perhaps he should just buy some new clothes. I told him I had nearly failed junior high home ec because of the zipper project and I would need to prepare myself. We had a good laugh, but it made me think. On some level, my almost-college-graduate still thinks parents are invincible (perhaps because he has yet to outwrestle me for the last chocolate chip cookie). As charming as this is, how many of us think that while we really aren’t ten feet tall and bullet-proof, we ought to be? Ask yourself, how many times have you squeezed in one last project because someone asked you, and it’s a good cause, and no one else had volunteered? How many times have you told yourself of course you can make one more batch of brownies for the bake sale, spend another afternoon calling for volunteers, fill in on that extra shift? This is the kind of person that keeps the world spinning properly on its axis, and I’m not saying we should refuse to pitch in when we can help. But we all have our kyptonite, and it really is OK to say no. Or tell your kid to buy new clothes. 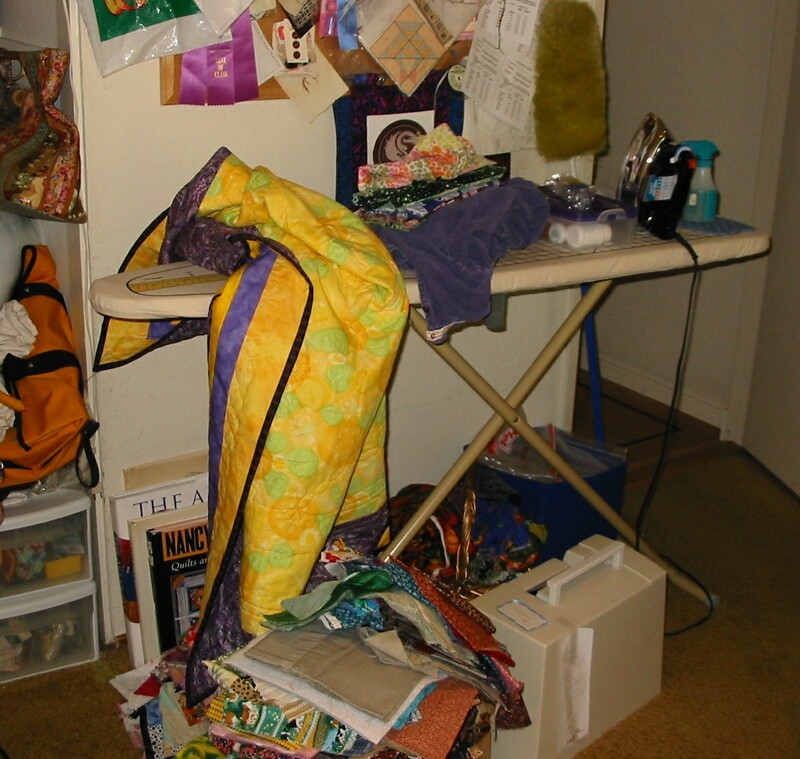 My projects were coming along, so in between cutting fabric for one quilt and clearing off the remains of another, I looked around again at things in the sewing room that I can live without. This turned out to be less of a good idea than you might think. When the kids went off to college, my husband made them clean their rooms. Not that I hadn’t tried for many years to get them to clean their rooms. My best year was when they were addicted to Power Rangers and they had to make sure beds were made and floors were tidy before they could watch TV. We lost ground after they developed taste. In any event, while cleaning their rooms they discovered all sorts of things they could live without. I discovered that I couldn’t, so I rescued them. First on the list was Godzilla. I used this little guy as a model when I put a fire-breathing Godzilla on a quilt for Evelyn Judson’s Progressive Party project. She had a tame little cityscape quilt that she wanted spiced up. 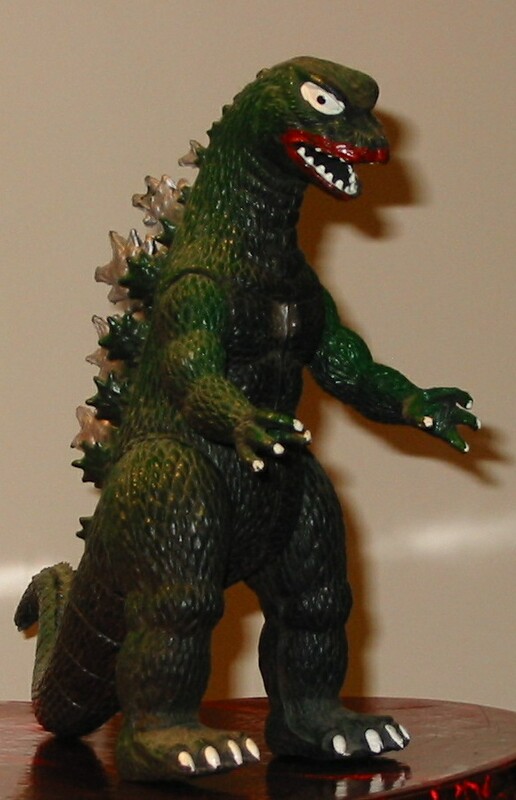 By the time I got it, it already had King Kong, so of course Godzilla was the next logical step. Evelyn loved the quilt, so how could I let go of the toy that has such wonderful memories? I snatched it from the give-away box and now it lives on my shelf. The kids’ stuffed toys also pulled at my heartstrings. I did end up letting them give away most of their Beanie Babies. I saved a couple of the cute ones, but those are in boxes, waiting for the kids to have homes of their own (as opposed to apartments for which we cosign). The bigger toys, however, practically begged me to reconsider. 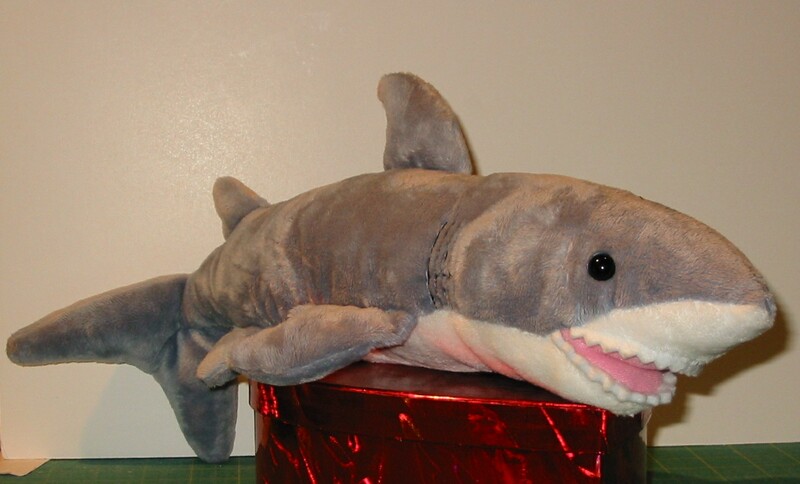 This shark, for instance. How could I say no to that face? So, it’s on the shelf, too, next to the stuffed toys my husband bought me when the kids were born so I wouldn’t appropriate the ones people gave them. The last toy I found belonged to my husband. It’s one of those perpetual motion things. 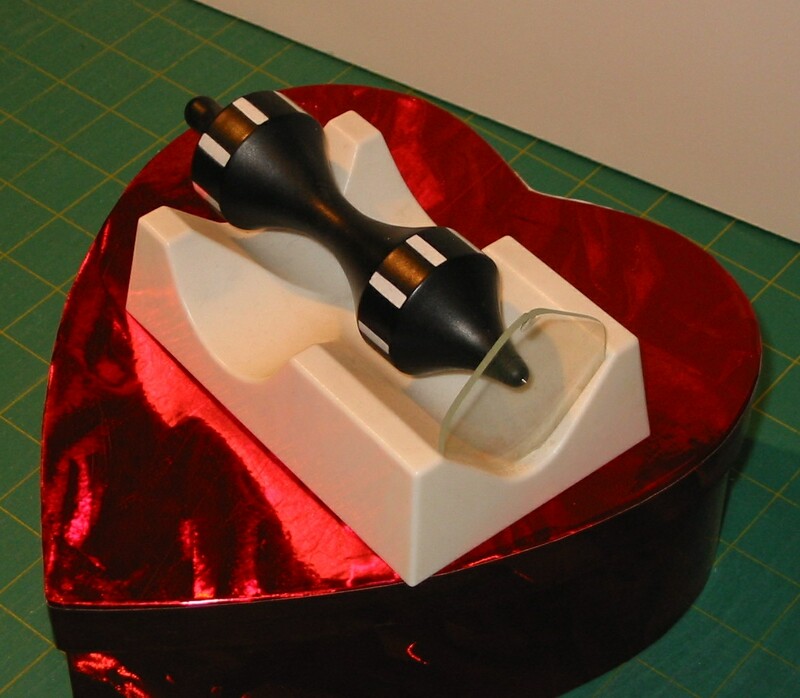 I bought it for his desk, but now there’s no room for it. He was ready to give it away, or even throw it away, but I was not. I might be able to give it away now if I knew it was going to a good home, but so far I haven’t found one, so there it sits, on the shelf with all the rest of the stuff I can’t let go. As for me, I gave up trying to clean and went back to the fabric. Perhaps tomorrow I’ll be less sentimental. I reclaimed tote bags this week. It’s not the Battle of Marathon, but it is a victory all the same. Much of my organizational scheme relies on tote bags (which is why my sewing room looks the way it does). Many of my totes are dedicated. There’s the guild meeting tote, which is actually a basket. It holds a pillow for those hard folding chairs, my name tag, sharing, and information about the latest projects for my friendship groups. 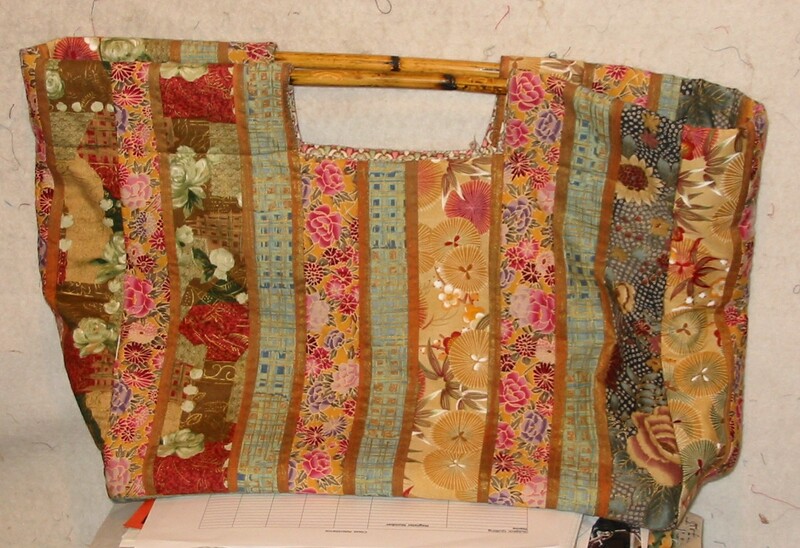 There’s the embroidery tote, which holds the crazy quilt I’ve been working on for the last five years and the embroidered fabric boxes I started with the scraps of the crazy quilt. There’s also the embellishment tote. This tote holds bags of silk ribbon, couching threads, and special beads I’m saving for the perfect project. I put them here so they wouldn’t get lost in the boxes and bags of regular embroidery threads, and beads. 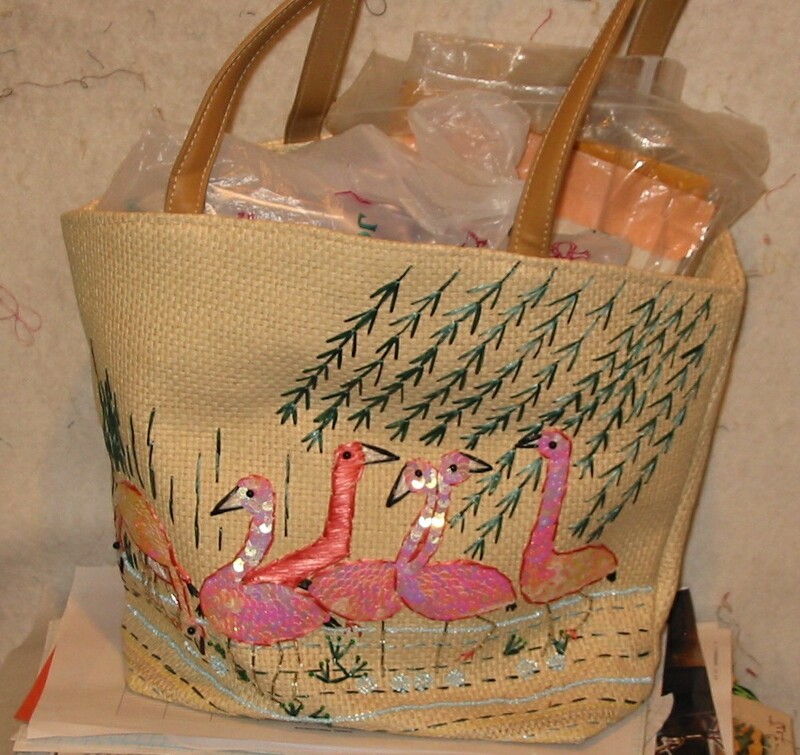 Sadly, for the much of the past year the flamingo tote was hidden behind a stack of books. I unearthed it while moving the piles, and now I can’t remember what all those perfect projects were for the contents of the bag. 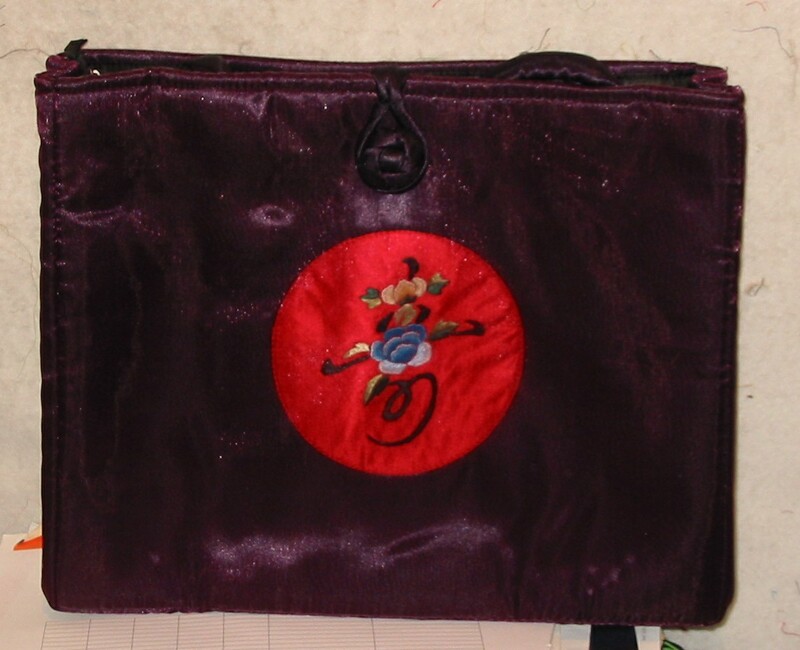 This is could be a purse, or a brief case. I remember buying it – and some of its sisters – for Christmas gifts. I’m pretty sure the reason this one is still with me instead of stashed on someone else’s shelf is because it’s purple. Then there are my go-to totes. My Asian fabric tote is perfect for business-type events. The bag is roomy enough to hold binders and supporting documents for the meeting, a book or small hand-work project in case I arrive early, and enough CDs to provide music for the trip. The reason this is a great meeting tote is that I can’t put it away with stuff in it. The bamboo handles would snap on the hook if the tote isn’t empty, so I have to take out all the binders when I get home. This doesn’t guarantee that I’ll type up my notes in a timely fashion, but it helps. 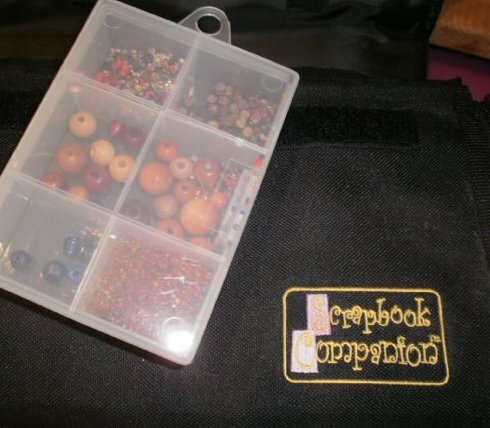 Finally, there is my favorite project bag. This tote was a gift from a friend who knows me well. 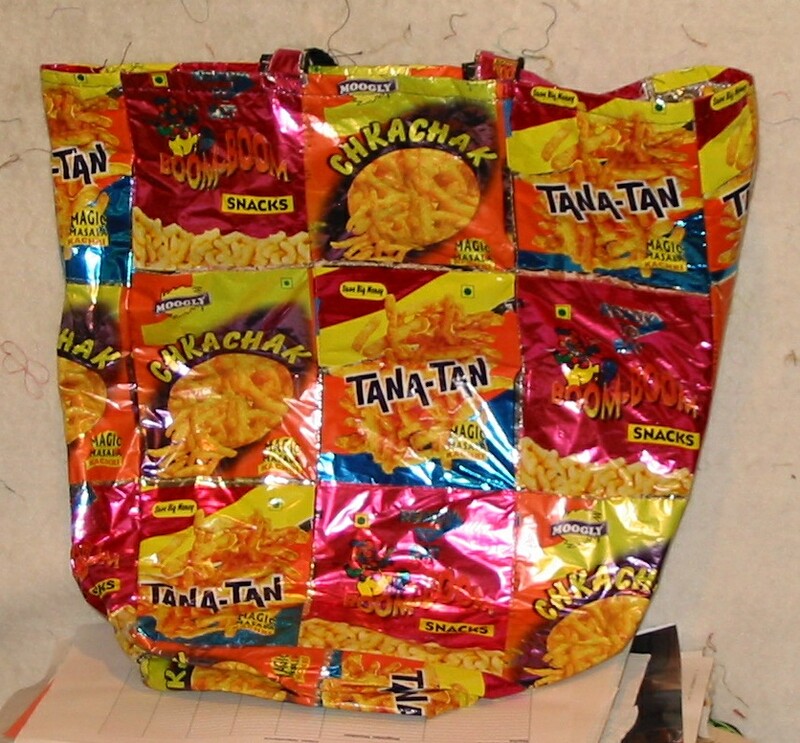 It was made in India from honest-to-goodness snack bags. It’s bright and shiny and rustles when I walk. No one else in the guild has a bag quite like it, so if I put it down someplace it will find its way back to me. It is surprisingly roomy and amazingly strong. While I might imagine myself as a raw silk bag with ivory handles and an antique clasp, in my heart I know that if I were a tote bag, the snack bag is what I would be.